In seeking to assess the impact of wind turbines based in Šilale region on the landscape, the analysis of cartography material was carried out and the inventory of all wind turbines was made (GIS data base). On assessing the importance of the road Klaipeda-Vilnius (No. A1), the impact was assessed from ten observation places (all the places were close to the roads). The main results of the research are established major factors of visual impact of wind farms, sizes of zones of visual influence and character of visual impact in different zones of visual influence. The main established factors of visual influence of wind farms are forested areas, relief forms and weather conditions. The wind turbines seen on the axis of the road perspective are not only observed for some length of time, but often serve as a landmark. Time is passing slowly, but meaningly, signing its presence on earth – trees. When the present becomes the past, and sometimes very distant, you can observe interesting signs. They are everywhere around us, if not destroyed by people. Alley of trees is one of these signs. Trees in the alley are growing side by side to each other, their branches intertwined as ideas in somebody’s head. Their interwoven roots give them the strength and strains – aesthetics and calmness of mind. The presence of alleys in landscape spaces concentrates attention on certain places in the environment and becomes a man-made elements in creative spaces. And only the time is capable to highlight distinct special characteristics of single tree in the alley upon becoming history. In historical spaces, large and small trees live beside each other and their lives depend on each other. While recovering the historical places you must pay attention not to destroy the whole system. To preserve the authenticity of the location it is a very sensitive moment. This requires a long and careful evaluation of the spaces in historical places of greenery. Alleys, as the elements of landscape architecture are also eco- dendrological complexes with micro-and macro-ecosystems. What is more important – art or ecology, or maybe the whole harmony? Having a park it means to have a project of high quality. The genus ViburnumL. comprises more than 230 species. Many of these species are used for ornamental purposes, but the species Viburnum opulus L. (European cranberry bush) is known for its edible fruits as well. V. opulus is widespread in eastern, northeastern, western, and central Europe and in western and eastern Siberia. To increase the use of V. opulus cultivars and clones in gardening, a better understanding of their seasonal development and biological properties is needed. American cranberry bush V. opulus L. var. americanum Aiton has been recognised as the same species and is closely similar to V. opulus.V. opulus L. var. sargentii (Koehne) Takeda is native to Korea, Northern China, and Japan. The cultivars of V. opulus were grouped by ripening of fruits, end of vegetation, and duration of vegetation stages. The early and late genotypes were selected. Cultivars ‘Leningradskaja Otbornaja‘, ‘Krasnaja Grozd‘, ‘Souzga‘, and clone ‘Zarnica‘ as well as clone P1were the most decorative. Breeding of new cultivars have been made from plants of both continents, primarily for leaf colour, fruit colour, and growth habit. The assortment of ornamentals used in geen areas of Lithuania is increasing every year. The common lilacs are very popular plants in Lithuanian landscape. The exposition collection of lilacs has been planted since 2002. Now there are 86 cultivars of common lilac. Propagation plants by tissue culture are important for obtaining of large number of lilac plants in a comparatively short time. The goal of our research is to present information about the micropropagation of lilac cultivars growing in the Lilacs exposition collection of Botanical Garden of Vilnius University. This article provides a review of the creation of landscape architect Charles (Carlos) Thays (1849–1934), former collaborator in E. André’s landscape agency, who had worked in Argentina and Uruguay since 1889. His proposed urban transformations and created green spaces in Buenos Aires, Montevideo and other cities of South America are described and judged. The article is prepared according to the data collected by the authors. The experience of public green spaces development within European tradition and its consistent patterns are highlighted – to acknowledge these important for the further development of park and garden art, and cultural heritage protection in Lithuania. Remnants of fortifications and post army's facilities, is one of the few remains of the old settlement category, which has survived to our times, as shown, as separate form of spatial terrain. There is nothing surprising in this, that the ruins of castles or fortifications, surrounded by greenery, have always been the object of interest of many researchers. When asked about their future, always evoke memories of a bygone age. How, then, to take care of these spaces, how to carry out the revitalization of the urban spaces, which is very often covered with many large-active legal restrictions, even from the point of view of archaeology and conservation. Nearly twenty years of dynamic development of civilization, industrialization and a strong human intervention in nature, resulting in current environmental changes, impacting both on humans and the ecosystem. These changes, often adversely affecting the area, in many societies began to increase pro ecological awareness. The pressure of ecologists led to changes in human expansion strategy by adopting the rules called "sustainable development". According to these rules, any developing of human activities should be conducted in a manner that minimizes the impact of the investment on the environment. Regulation of rivers, used to improve the navigability, or the protection of human habitats from the effects of flood flow, is one of the areas of engineering, the effects of which were backing the protests of ecologists. They have a similar attitude to any trials improving the possibilities of better quality of space located along the rivers. Part of the arguments brought by ecologists concerned to the destruction of a unique landscape or affecting the habitat of animals living in the river or areas adjacent to it. Other, completely negated the needs for human intervention in shaping the nature of these regions, which supposedly "... itself can handle". Finding the right balance that meets the needs of all stakeholders is difficult, but not impossible. It is particularly important to revitalize urban public spaces which are located close to the rivers. Leaving the landscape of the river passing the city limits, as formed in an uncontrolled, wild, natural space seems to be a number of reasons unlikely. We should use civilization and our evolution's tools, and try to use these sites, by increasing their attractiveness. The target is to improve the quality of life of urban residents by developing the riverside associated with the river, often stimulate them to life, with the broadest possible protection of the environment. The article presents the analysis of the development and reconstruction solutions of the Potsdamer Platz in Berlin in the context of sustainable urban development. The methods applied in this research include literature review, the analysis of historical development of the square, analysis of maps and historical material, the survey of the territory on site, extensive photographic survey, and the assessment of urban, architecture, and landscape architecture solutions using the special systems of criteria. The concluding section contains the conclusive evaluation of reconstruction solutions; in this section the main attention is devoted to sense of place and continuity, ecology and sustainability, ethics and aesthetics, and the phenomenon of commercialization. During the recent period, the development of Klaipeda city is rising. Conversion in different parts of the city is carried out, the central part is densifying, urban silhouette and the public space character are changing. Old Town rectangular street network in the target structure is still dominant, H. Manto street passing through the central part of the city does not gain a clear representative image. In the absence of a clear concept of urbanistic development of the city's central part, it is hard to look for a location for new musical theatre building, and there is uncertainty regarding the planned three-dimensional structure of Atgimimo Square in the future. “Akropolis“ shopping center keeps dominant role in the city, offering community based services, thus reducing the Old Town and H. Manto Street's vitality. In the absence of a representative urban landscape approach to improve the quality of aesthetic appearance of the city, many of the more important areas not gain completeness and the ensemble features. Representativeness of the city lost a lot without saving elements of urban green spaces, formed in previous General Plans. It is important to timely return to the River Dange‘s visual and functional tract planning. Having evicted the industrial enterprises previously located on the riversides, there is an opportunity to create a very important city representational landscape frame axis. Authors of this article, considering the central part of the urban development trends, provide some suggestions on the more important parts of the representational landscape frame formation. Public spaces by Lithuanian legislation are described as the land plots where are planned to equip squares, parks and other green areas. It is at the common use areas intended to meet the needs of society, they are formed of streets and roads, paths, engineering communications corridors, recreational areas, sports fields and other spaces. So, a public space can be closed and open, but in this article it is restricted to a single type of public spaces-city squares analysis. The city public space can be subdivided into three groups (in accordance to developed type). In the third group there is described a space which satisfies the social needs of the population (social, gathering, active rest) (Gehl J., 2006). In the article there are analyzed spaces which have listed the social space features, also here are presented detailed Klaipeda city, Square "Atgimimas" analysis and principles of the formation. Alytus has three Roman Catholic municipal cemeteries, which have been landscaped during the different historical periods and epochs of the town development. The expansion of the present cemetery located in the town is limited, thus the village of Užupiai has been chosen for newly established cemetery. Site's topography (forested area) was taken into consideration and influenced its unique layout of irregular shaped burial sections. Greenery of the cemetery can be conditionally divided into three categories: public area plantings, background plantings and gravesite plantings. On the whole, ornamental woody plants of 120 species and taxa of lower rank (80 species and forms are Pinophyta and 40 – Magnoliophyta) are grown in the plantings of the new cemetery of Alytus. The plants belong to 16 families and 28 genera (Pinophyta – 3 families and 9 genera, Magnoliophyta – 13 families and 19 genera). The most abundantly represented families are: Cupressaceae Rich. ex Bartling – 64 plant taxa, Pinaceae Lindl. – 12, Ericaceae Juss. – 11, Rosaceae Juss. – 7 and Berberidaceae Juss. – 5. According to life forms the plants are distributed as follows: trees are 28 taxa (23.4 % of all plants), shrubs are 81 taxa (67.5 %), subshrubs are 10 taxa (8.3 %), liana is one taxon (0.8 %). In accordance with the former comprehensive plan of Kaunas the attention was paid to recreational infrastructure providing improvement of quality of stable and balance zones from ecological point of view; the aim was to harmonize natural and urban frames. However, the results of monitoring of implementation of the comprehensive plan let to state, that natural areas were developed marginally, the maintenance and management of the existing green areas mainly took place, the development of mono-functional commercial, warehousing and logistics areas was more intense, the development of industrial areas was less intense and only single public spaces and objects were developed. Objective to develop the city greenery system as a component of green infrastructure while preparing the comprehensive plan of Kaunas till 2023 determined the necessity to evaluate the existing potential of the system and to foresee the possibilities of its increase. Considering this, the purpose of the article is to present the results of Kaunas greenery system potential evaluation comparing them with the evaluation results of the potential of other urban sub-structures and other cities greenery systems and to present the possibilities of the potential increase. The analysis results led to propose the target theoretical model of the greenery system, potential areas of natural frame in Kaunas city, opportunities for increasing of integrity and permeability of the greenery system and diversity of its structural components. The article analyzes aspects of the smell sense in the experience areas landscape planning. There are presenting the influence of the smell sense to experience areas landscape planning. There are analyzed the possibility of use of the smell sense and woody plants ornamental quality in the planning of different kind of visual and emotional experience areas landscape. The article discusses the modelling of plant selection and origination methods in order to differentiate plants according to their resistance in winter. For the purpose of research, a direct link between plant health and possibilities of their cold acclimation level in vivo in appropriate climatic conditions during the investigation period was analysed. In this article, the importance of cold acclimation speed of strawberry varieties with different cold hardiness in the selection and differentiation of plants in accordance with this feature is discussed. This article analyzes the current novelties of the environments of the residential districts, as well as the esthetic conditions of the apartment houses walls. The attention is paid to the walls renewal methods while searching for modern ecological and economical design of a building. There are analyzed wall paintings, vertical greening, combination of paintings and plants. The article states the cons and the pros of those methods and the possibilities of their implementation. Wind farms are the result of the needs related to the production of renewable energy. They are composed of many wind turbines, which are characterized by a considerable size. It is associated with power plant efficiency and profitability of the investment. For this reason, wind farms are located in open areas, often on the hills, near seas and lakes, away from building. The height of tower of power plant, spread of the rotor blades and a large number of power plants, measurably affect on the landscape. It constitutes a clear dominant in the landscape, rebuilding the existing understanding of the term "dominant" in the open landscape. Wind farms predominate in landscape, are visible from many miles before the farm. In addition wind farms affect the reading and understanding of a wide panorama viewing behind farm. Often it is a protected area, which has not only special environmental value, but also the landscape value. The article describes the interaction of location, size and visual impact of a wind farm, in the aspect of landscape “background”, which is protected by environmental areas (national parks, landscape parks). Well organized infrastructure of river tourism can become an attractive cultural-cognitive activity. The net of the Lithuanian rivers is favorable for river tourism and recreation. The biggest rivers of the country are used for different purposes: sports, cultural and cognitive tourism and recreation. But small rivers perform usually only sport tourism function. Due to the fact that rivers perform not only connection function, but also join different size and functions territories, also reflect surrounding nature, it is extremely important to preserve these features and to revive them while modernizing recreational environment. The paper aims at revealing the peculiarities of implementing Environmental Management System (EMS) at Public Enterprise Alytaus parkai. Environmental aspects resulting out of activity carried out by the enterprise are analysed. The basic factors exerting negative impact on environment and human health are highlighted too. It is stated, that the majority of employees were aware of the damage caused to environment and human health by the enterprise’s activities. The greatest part of them would prefer to have the EMS implemented. 9 species of stonecrops (Sedum) highlighted as suitable for the formation of long-term plantings on roofs are as follows: S. album, S. aizoon,S. caucasicum, S. hybridum, S. middendorfianum, S. rupestre, S. sexangulare, S. spurium, S. telephium. 41 species of stonecrops have been tested under conditions of Botanical Garden of University of Latvia (BGLU ). The bio- morphological data to which it is necessary to pay attention in selection of the assortment of plantings on roofs: habitus, features of root system, longevity, type of active growth, are provided. 14 species, application of which should be avoided in perennial plantings with extensive care, are mentioned. Experimental data obtained in the stands of the Botanical Garden of LU are compared with observations made in 2007 and 2013 on green roofs in Latvia. Stonecrops having compact rootstock or far creeping rhizomes – S. hybridum, S. middendorfianum, S. spurium, are proven against erosion and are good in practical roof greenery in Latvia. Data used in this paper are the result of many years of introduction comprehensive studies in collections of the Botanical Garden of the University of Latvia and expositions to identify their biological characteristics and the possibility of growing and use in greenery. Described 12 taxa of Potentilla successfully passed the introduction. The following information about Potentilla is presented: growth form, longevity, type of active expansion, the seasonal dynamics of development characterized by the basic terms of phenological phases, duration of the vegetation season and flowering, the possible range of garden habitats and adjacent plants. Materials of perennial phenological observations in most cases are processed statistically. There are observed cinquefoils - basically medium long-living perennials (short-living species P. argyrophylla and P. nepalensis) and three long-living species (P. aurea, P. cinerea, P. neumanniana 'Nana'). They begin their growing season in the second half of April, after the establishment of the average daily T +50C, but a dying of the vegetative parts of plants, that haven’t wintering crowns, complete by the end of October. The average decoration peak of this taxa occurs at the end of May – beginning of June. The following taxa bloom in the second half of the summer: P. megalantha, P. nepalensis, P. neumanniana 'Nana', P. thurberi. The most durable longevity of positive decorativity of flowering and non-flowering part of habit have been observed by P. atrosanguinea, P. neumanniana 'Nana', P. thurberi. Least long decorativity have the next species: P. alba, P. argyrophylla, P. flagellaris, P. nepalensis. The cinquefoil is better to use as a subdominante or filler in the compositions of plantings. For dominant role in composition can be used P. atrosanguinea, P. thurberi, P. neumanniana 'Nana'. All described species of Potentilla taxa (except P. recta) are suitable for using in architectonic type plantings and nine - for natural type plantings. Described varieties of cinquefoils taxa may be used in five garden habitats: all of them – in open space area, in flowering meadows - three varieties and four - in stony ground areas, on the building roofs and on the slopes. The research has been conducted for four years (2009–2012) on three phytocenoses located in flooded meadows that are in the riverside, central and pre-land parts of the Nemunas River Delta. The aim of the research was to estimate the influence of humidity regime on structure of plant species of Poaceae family. The riverside part of the Nemunas Delta flooded meadow was characterized by the biggest variety of species of Poaceae family (9) and population stability. The humidity regime has a significant effect on distribution of Festuca rubra, Festuca pratensis, Festuca ovina. Medicinal, aromatic and spicy plants adorn the homestead environment for the multi-coloured blossoms and leaves, dress air with moisture, spread phytoncides and essential oils which stimulate human organism. Therefore this article analyses medicinal, aromatic and spice plant species of some residential houses environment, associated with a healthy living environment formation opportunities. Here are presented the preliminary proposals for improving low-rise residential houses aesthetic quality of the environment and for forming a healthy, clean and beneficial microclimate. In the article are presented data for the 2006–2013 year detected fungal diseases and their agents of spice plants of Lamiaceae family cultivated in Medicinal plants sector of Kaunas Botanical Garden of Vytautas Magnus University. The examined plants were damaged by 13 species pathogenic fungi. The most dangerous infections diseases were mildews and leaves spots. Most of spice plants of Lamiaceae family cultivated in Kaunas Botanical Garden were without symptoms of infections diseases. This article reviews the tropical plant growth potential in the public interior. Investigations were carried out in the period of 2005–2013 in the greenhouse and in interior of Kaunas Botanical Garden of VMU. There were studied 130 taxa of tropical plants. Longevous analysis allows diagnosing of optimal growth conditions and offering good plant assortment. Plant growth limitations are as follows: light, especially in winter time; humidity in interior in winter time. This article presents analysis of new kind of spaces which are forming in rural and urban landscapes interface zones in sustainable development context. The study aims to formulate and develop conceptual provisions for rurban landscapes assessment, prediction and regulation of changes. To achieve this objective, we have formulated the hypothesis of the research that includes seven hypothetical statements. 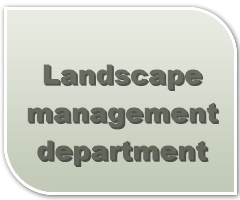 The concept provisions of characterization, assessment, and regulation of changes of the rurban landscapes with examples of their application are developed in the section "Results and discussion". The research revealed the peculiarities of Lithuania in the study area and demonstrated the need to assess the local specifics of the rurban landscapes research from the early stage. Green Infrastructure in the Image of the Present Public Spaces. Greenery in the present metropolis, cities and villages plays a role of a strategic element, which decides in a great part about the sustainable way of the development. The subject is broadly analyzed in the books and articles and well known in a traditional way. Though, it is worthy of a new look considering the fresh literature, which indicates the inspiring approaches on time, in the field of nature and human environment. Ecological aspects are connected with the public spaces in a direct way. We observe it in the everyday life, where markets, squares and streets are shown as "equipped" with trees, flowers, and grass. However, in the bibliographical sources there are examples of public places shaped under influence of nature as well. These states of knowledge will be presented by several science data from recent years. The purpose of the paper is to find the literature about the role of green infrastructure in urban and rural public spaces. The results will disclose, that the creation of "green" places shall happen not only by the discovery of the basic indicators for its composition, but also by stating that the harmony or tension, static or dynamic character of "ecological squares" may be result of a spontaneous acting, not listening to the compulsory numbers. Professor Konstantinas Jakovlevas-Mateckis is the founder of the original school of industrial environmental architecture and industrial surroundings design, the creator of its theoretical principles. He accomplished 37 scientific research works in the field of architecture, landscape architecture and environmental design, prepared about 100 projects, wrote scientist papers.